I'm not that big into presents. My husband however is thanks to a Mom who gets really excited about them and wraps them beautifully. Presents stress me out sometimes. This probably relates to my love/hate relationship with shopping. When I realized I needed to get Benjamin a present on our wedding day that was a big stresser. Too much pressure it seemed, especially seeing as I wasn't about to get him the gun I know he wanted. Starting out on a bad foot?! Nope- we're fine. Now that I am married to someone who is often thinking of things they'd like, both practical and not, I too think of things that would be nice to have. These are all of course on Pinterest for me to think I'll someday go back to and purchase. 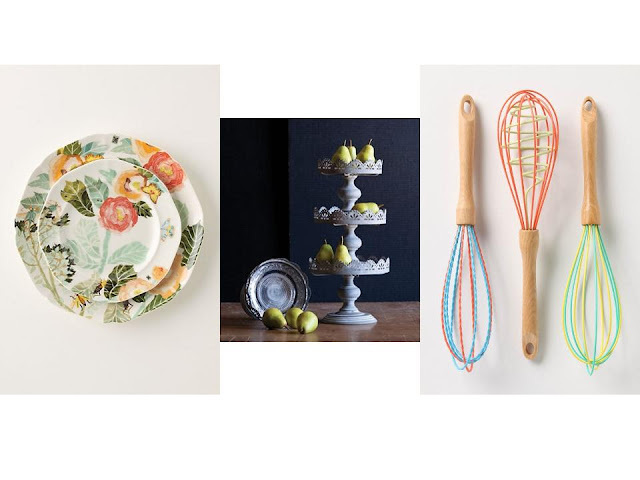 Of course there are things that could really spruce up the kitchen. Lovely plates from Anthro are totally impractical but gorgeous. A cute pedestal cake stand would be nice because you can't ever have too many and maybe I'd use it to hold lotion and soap in next to the sink. Or what about the cutest whisks you've ever seen? Also from Anthro of course. 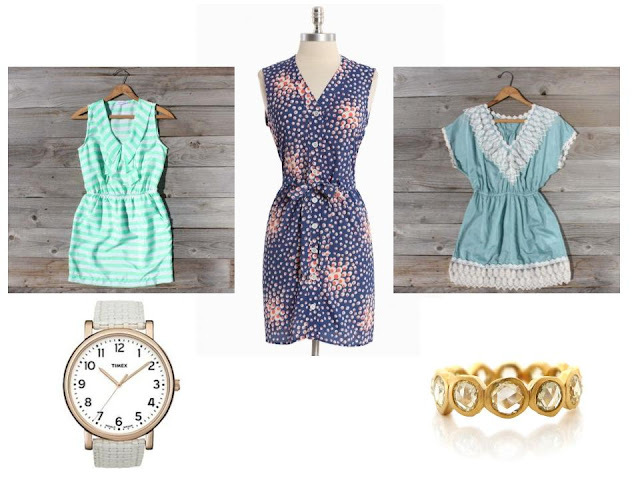 In a summer where I want to stay cool, look cute, but still be practical the lovely stripe seafoam dress would be awesome, or the blue button dress. And as for the tunic? I see it looking quite perfect with my white capris when we get a date night perhaps or are strolling the streets of Santa Barbara. I have the Timex watch with a brown leather band but think the white one would be fun for summer. It's reasonably priced so a good watch to wear around babies. To be totally impractical that ring is amazing. It's made by the same person who made our wedding rings and well, I wouldn't be upset if I ever got some more jewelry made by him. Reality is, I don't need a present for Mother's Day. I really didn't like the idea of a push present and I still don't. I like words and hope to get some lovely ones from my husband on Mother's Day. As for all this stuff? I wouldn't turn it down, but also definitely not expecting it either.